So we wondered what the big story of the European Council would be. Now we have the answer: Merkel’s cell phone. 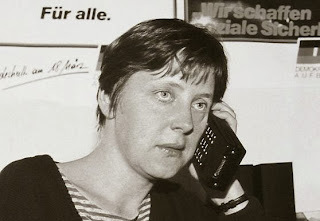 Der Spiegel today alleged that Merkel’s phone may have been targeted by US security services. Merkel called President Obama to make clear that she “unequivocally condemns such practices” and was told that the US is not monitoring and will not monitor her communications (which as German media commentators have identified leaves open the possibility that this could have taken place in the past). The US Ambassador in Berlin was also summoned for a dressing down which follows similar action taken in France over allegations the US also spied on French diplomats. Because this issue has been hyped-up by the media, this has the potential to be more damaging to Anglo-Saxon-Continental relations than arguably any other episode since the Iraq war – and there are lots of things going on here. Civil liberties vs. security: As ever, this encapsulates the very sensitive trade-off between the obligation of the state to ensure the security of its citizens and the right of the citizens not to have the state arbitrarily snooping in their business. The Germans – given the painful memory of Stasi and Nazi surveillance – are particularly sensitive to this (and that the German Chancellor herself is the alleged victim adds fuel to the fire). Forget everything else on the agenda of the EU summit today, this is what really is creating the headlines in Germany. Data protection – EU vs national: Some EU leaders and politicians – including Justice Commissioner Vivianne Reding (for whom this issue is like ideological steroids) are keen to use the long planned overhaul of EU data protection rules to enforce greater EU-level safeguards, though the link to the tapping of Merkel’s phone isn’t entirely clear. France and Poland are reportedly keen on fast-tracking this issue through the EU legislative process while others including the UK and Scandinavian countries countries are less keen. Germany has not committed itself either way (although German Interior Minister Freidrich said the current version would have to be revised). The UK vs France: However, the same Data Protection Directive that France wants to pass also featured in the recent UK business taskforce report as an example of EU rules which hurt innovation and growth, and argument echoed by Rohan Silva in today’s Times. Medical research charities have also warned that the new rules – specifically a series of amendments tabled by the Green MEP Jan Philip Albrecht – could starve them of the data they need to work on new treatments. So this issue might also indirectly pit the UK versus France. This is also putting Cameron in a very awkward position as he doesn’t want to offend either the Germans or the US – but he’ll most certainly be pressed on taking a position. Secondly, the European Parliament – which also needs to approve the final deal – may see an opportunity here to hijack TTIP to exert its own power. The EP has form on privacy and civil liberty issues, as seen by its attempt to take SWIFT hostage. In fact, SWIFT itself could be complicated by the accusations against the US (we’re not saying that the EP doesn’t have any valid arguments in this area). So this is an episode that most certainly will reverberate for quite some time.